Before there was an Easton, there was a North Fairfield Parish, which was officially established in 1762. Church records show October 14 was the exact date that the church was established. This was both an ecclesiastical and a governmental organization, and established the sites for five schools and a house of worship. Due partially to the hilly terrain of the town, population in North Fairfield was spread out and families earning their living on small subsistence farms. 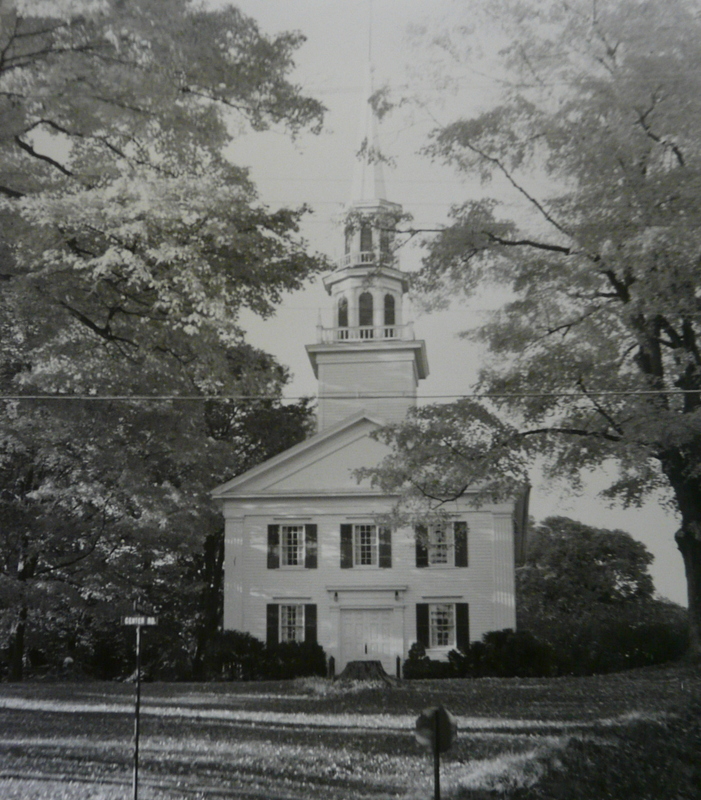 The North Fairfield Presbyterian Church – the Congregational Church of Easton’s predecessor – was erected in 1763. On November 4, the Parish Society of the new Church voted to call Mr. James Johnson to its ministry. Mr. Johnson “cheerfully accepted” the offer and on December 14, 1763 was ordained as the church’s first pastor, a position he held for 48 years. In 1787, neighboring parishes of Norfield and North Fairfield joined to become the incorporated town of Weston. The region had been plagued by poor communication and travel due to disruptions from the Revolutionary War and second-rate roads. However, the goal ultimately proved elusive as the new governing body was unable to improve infrastructure in the region, even though the war had ended. The Staples Free School first opened its doors to poor students in 1795. Since the Old Academy Building is an important part of the Church history, it is worth mentioning. The school was established after Samuel Staples passed away in 1787 because he established in his will that part of his 400 acres estate should be dedicated to “poor schollars.” No longer used for educational purposes by 1930, the building started being used as a temporary church hall after the original church hall burned down. In 1937, Mrs. Theresa Sherwood and Mr. Eugene E. Norton purchased the building and donated it to the church. With an addition built in 1962, the building is still used today to house church offices, youth space, a conference room, and church hall. 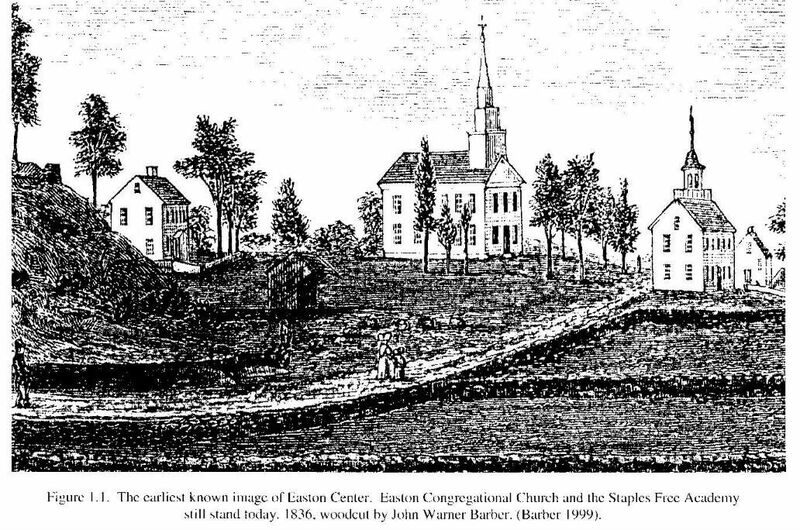 In 1825, the church became known as the North Fairfield Congregational Church. This did not imply a change of denomination. By the next year, the church was in such deplorable physical condition that members decided to build a new Meeting House on the site. They selected James Johnson, son of the first pastor, to build the church and salvaged whatever material they could from the old church. Some of the old notched beams can still be seen in the church basement today. The early 19th century was also marked by a period of spiritual upheaval in New England. Many members of the congregation left to join new Methodist, Episcopalian, and Baptist churches. At one point in the 1830s, membership of the Congregational Church was down to only seven men and 24 women. The new church was dedicated in 1836, and is still standing today as our current Meeting House. It included an important new invention: the wood stove, which enabled heated church services for the first time. The Reverend Charles Prentice was ordained in June that year. The dedication of the new church represents the start of a time of prosperity for both the church and the town of Easton. With religious upheavals in the country ending, the Congregational Church began growing. Membership grew to 102 by 1845. 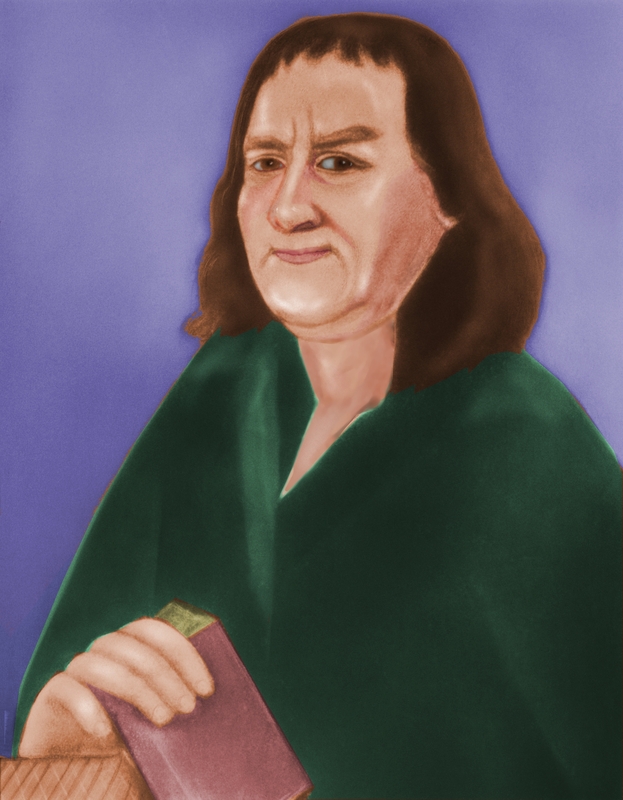 The church also benefited from gifts of money from the Domestic Missionary Society and an increased tax on its members. The year 1845 also saw the establishment of Easton as a separate town from Weston. Farming was still the primary activity of most residents. But, the new industrial revolution led to the creation of new mills throughout the town. The many streams in Easton made it an ideal spot to build a mill at a time when water power was still popular. Many of mills produced farming tools like axes, forks, hoes, and wagons. Shoemaking was the most popular industry at the time, employing 44 people and producing 3,362 pairs of boots, and 577 pairs of shoes in 1845. Between the end of the Civil War and the early 20th Century, the population of Easton declined. New technologies made water power obsolete, and new factories set up in large cities like Bridgeport attracted young workers. The west also attracted young people from the area, especially the “new Connecticut” – the current state of Ohio, which advertised cheap, fertile land without rocks, and “low taxes but still a New England way of life.” With the population of Easton declining, Church membership also declined. In 1895, for the first time, women were admitted as members to the church. After Reverend Martin Dudley retired, a series of student pastors served the Church until 1922, when the 75 church members decided they should once again hire a settled minister. By then the automobile age had arrived, and Easton, while still a sleepy rural town, was becoming attractive to the new commuting families. In 1926, the Society Committee called the Reverend Luther Stone cipher of Yale as full time pastor. The United Church of Christ came into being in 1957 with the union of the Congregational Church and the Evangelical and Reformed Church. The Congregational Church of Easton joined the UCC that year. Individual churches within the UCC choose their own names and call their own ministers. 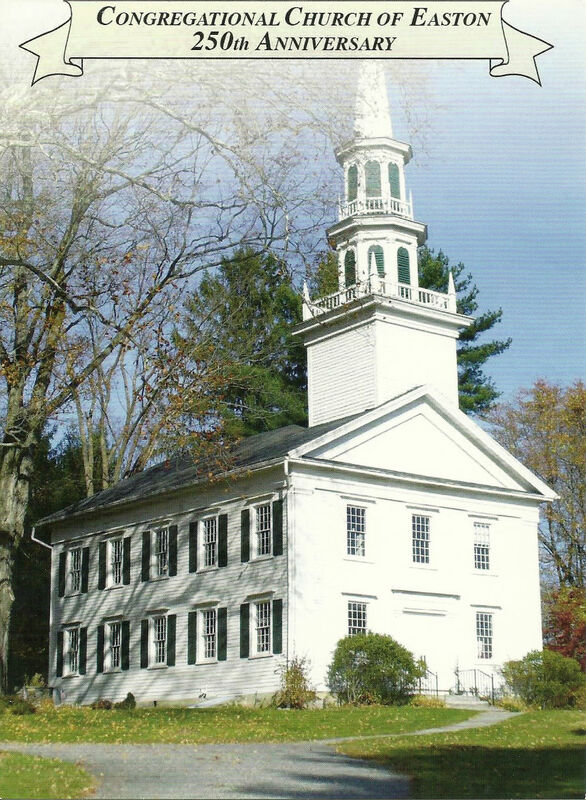 In October 2012, the Easton Congregational Church celebrated its 250th anniversary. Festivities included live music, historical discussions led by church historian Jonathan Stock, a colonial era worship service reenactment, and a fellowship barbecue picnic. A Brief History of Easton v1 033112 by the Historical Society of Easton, CT.
Congregational Church of Easton archives. Partridge, Helen & Mellen, Francis. Easton – Its History, Collinsville, Connecticut: Lithographics, Inc., c1972. Samuel Staples and the Congregational Church, hand typed document in the Congregational Church of Easton historical collection.